Find the minimum element.You may assume no duplicate exists in the array. This problem is a binary search and the key is breaking the array to two parts, so that we can work on half of the array each time. If we pick the middle element, we can compare the middle element with the leftmost (or rightmost) element. If the middle element is less than leftmost, the left half should be selected; if the middle element is greater than the leftmost (or rightmost), the right half should be selected. Using recursion or iteration, this problem can be solved in time log(n). 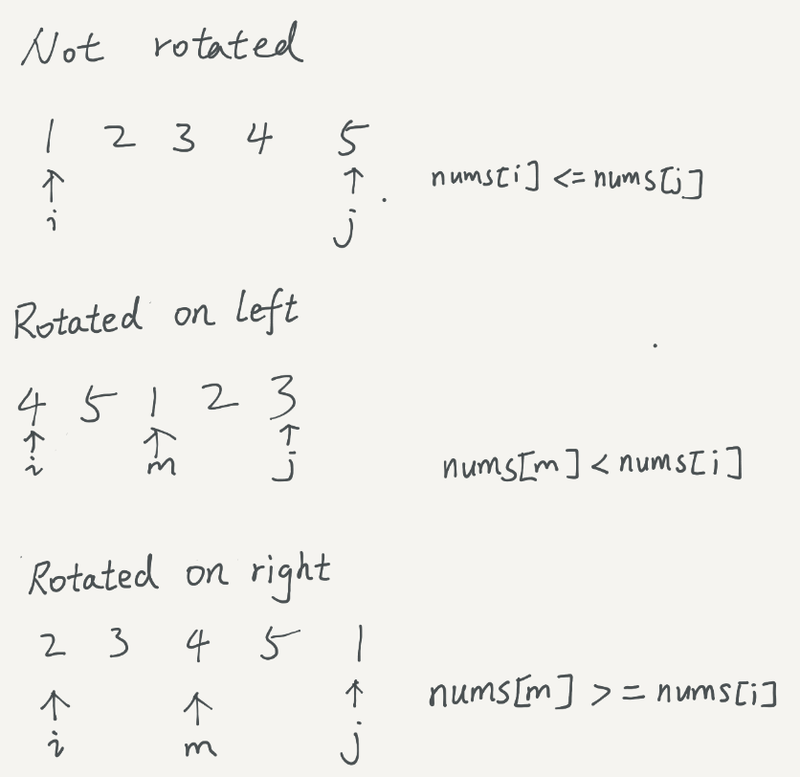 In addition, in any rotated sorted array, the rightmost element should be less than the left-most element, otherwise, the sorted array is not rotated and we can simply pick the leftmost element as the minimum. Define a helper function, otherwise, we will need to use Arrays.copyOfRange() function, which may be expensive for large arrays. Because you rotated it wrong. The pivot is not a stationary number in this question. SO you don’t keep 4 locked. The above proposed algorithm works in O(logn), since the problem statement says no duplicates. Simpler solution with O(n) time complexity in worst case.